Covenant Home Health Agency LLC is state-recognized and established as a leading provider of home health care. We are proud of this accomplishment, and continue to maintain that image. We do not allow ourselves to be complacent, especially since we are in the service of improving lives through affordable and quality home health care. We make sure that the variety of home health care services we offer suits your needs. To achieve this, our care team works closely with your family and your physician in coming up with a plan of care that is just right for you, and will bring out optimum results. You are in safe and expert hands with Covenant Home Health Agency LLC. Our home health care team is made up of warm, dedicated, and skilled individuals who are experienced in their individual home health care fields. Carefully chosen from among several applicants, they have passed our screening process to bear our name in bringing our own brand of home health care to you. 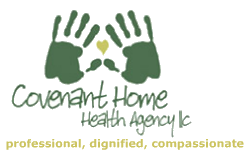 Covenant Home Health Agency LLC invites you to ask any questions about our company. You may direct them to phone number 614-522-0521.